Prepare the fennel and the broth. Saute the sliced fennel in the oil or butter over moderate heat, browning it a little. Add a little water, turn the heat down, cover the pot and let the fennel braise. Add a squeeze of lemon and set aside while you make the risotto. Meanwhile, bring the chicken broth to a boil, add the fennel trimmings (not a lot of fronds) and cook slowly to impart a fennel flavor to the broth. Or make a vegetable stock using fennel. Make the pesto. Place fennel fronds in a food processor, Add a little olive oil, salt, a few pine nuts for texture, and garlic if using. Process until it makes a thick pesto. To make the risotto, saute the onion slowly in the oil and/or butter. Add the rice and stir to coat. Add the white wine and stir to allow it to evaporate. Add 1/3 cup of stock, turn the heat to medium low or low (so it just simmers) and stir until the stock is absorbed. When the liquid is absorbed, add another 1/3 cup of stock, wait until it’s absorbed, stirring occasionally, and then repeat until the rice is tender but still al dente. This process will take about 20-25 minutes. 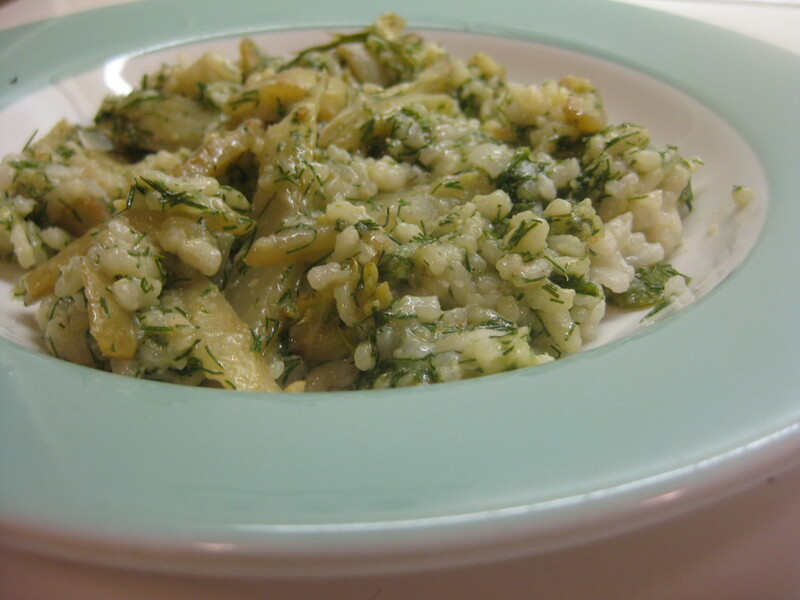 Add the braised fennel and fennel frond pesto to the risotto, and adjust seasonings.